"This shot was taken on an early summer day in Rocky Mountain National Park in Colorado," said Scott Elias. "As you can tell the coyote is still a bit scruffy from his winter coat." "It was a gray, overcast day so we decided to do a shorter trail from the Bear Lake Trailhead up to Dream Lake. Since rain (or snow!) was a possibility, I decided not to bring my Digital Rebel on the hike. All I had was my trusty old Canon G1." "Good thing, too, since as soon as we got to Dream Lake (only a mile from the trailhead) it started to thunder. We practically ran back down the trail to get back in the truck and decided it would be best to head into Estes Park for lunch and a nap. 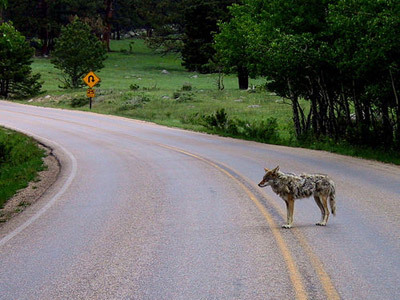 On the way down from Bear Lake, this guy wandered lazily onto the road in front of us. Since I didn't have a long zoom, I had to get pretty close for a decent shot. I stepped out of the truck keeping the door open between me and the coyote, steadied the camera in the window frame, and squeezed off this shot before he bolted back into the forest."